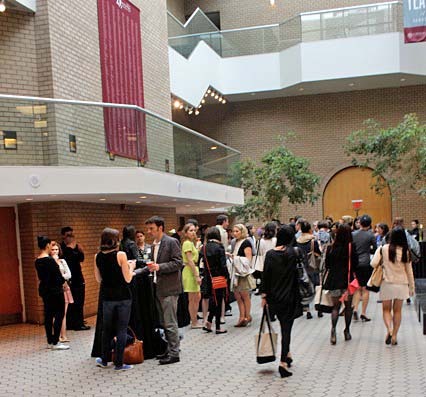 The Symposium entitled, "Well Dressed" was held at Fordham Law School at the ungodly hour of 9 AM. While most of the fashion crowd is sleeping at that hour, the audience was overflowing perhaps due to the lawyers and scholars in the audience. I myself am a lawyer (Harvard Law School graduate) and was curious to see how dressing well could be integrated into a scholarly dissertation for nine hours; would the fashion police appear handing out subpoenas and citations to those flouting fashion law? Actually, the program was informative covering topics such as fashion copyright and trademark, fashion philanthropy and not for profits, labor laws for the fashion industry, and the exciting future of 3D fashion printing. 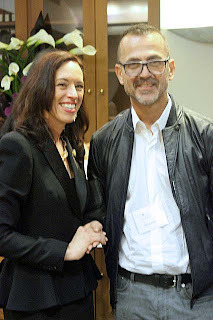 The symposium led by Susan Scafidi, Professor and Academic Director of Fashion Law at Fordham University, started with the acknowledgement that fashion is more than skin deep and then delved into the importance of public relations and the media to big brand survival. Louis Ederer, partner at Arnold and Porter, was lead counsel for Gucci in the case of Gucci vs. Guess where Gucci was suing for copyright, trademark and trade dress infringement. He recounted how pivotal it is to have a media strategy in advance due to the rapidity of the press's access to court information. Moreover, the need for quick reactivity time to counter negative and often inaccurate press reports becomes more crucial in our society which quickly deciphers information. However, he also felt it key not to get distracted by the reporters which can cripple your ability to adequately address your clients' needs and focus on the case. 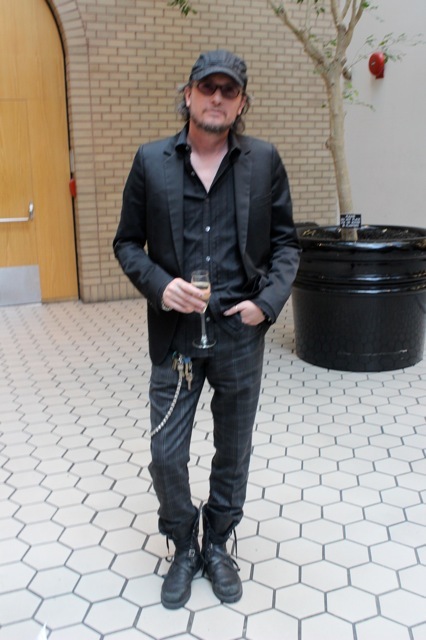 Harley Lewin, a partner at McCarter and English, and a leading intellectual property lawyer, who represented Christian Louboutin in its case against YSL, said he felt it critical to create a narrative that would become the press story for Christian Louboutin; the story, which the press quickly adopted, was of a guy who came from poverty and built his business over twenty two years becoming both a shoe mogul and a person who gave back to the impoverished during the course of his career. Lewin stressed the importance of being mindful as to which news outlet you are addressing; the way you tailor your message to Page Six and CNN have to be different as they both have different agendas to spin. Louboutin lost its case in the district court which ruled that a single color can never serve as a trademark in the fashion industry. However, the appellate court demurred and ruled there is no trademark on a monochrome shoe with a matching sole however, when the red outsole contrasts with the remainder of the shoe Louboutin's trademark would be upheld. This was a landmark case which the fashion industry and worldwide media covered closely. Jyotin Hamid, a leading lawyer in intellectual property, who represented YSL against Harley Lewin and was also on the panel, stated that the case was a victory for both Louboutin and YSL. Paradoxically, YSL was pleased that they preserved, in part, the red sole trademark of Louboutin since YSL has a personal interest in protecting and conserving brand owner rights from trend followers who steal ideas. Hamid said a big strategy for his team was to ensure that the YSL brand was not degraded and viewed as a copycat by the press; in fact, they were able to achieve this as the press spun it as two huge prestigious brands fighting over their integrity allowing each company to maintain its status. At the conclusion of this lecture, most of the panel concurred that there was no such thing as off the record in the media. The symposium then explored the connection between fashion and philanthropy. Steven Kolb, CEO of the Council of Fashion Designers of America, informed the audience that his background was in not for profits and not in fashion. He said the CFDA works on intellectual property issues, supporting emerging designers, supplying designers with global opportunities, and charitable work in the fields of AIDS, breast cancer and disaster relief. Additionally, the CFDA awards scholarships to those who excel creatively regardless of their economic needs. Rachelle Stern, senior counsel at Macy's, recounted how important it is for a company which trades publicly "to do well and do good" at the same time since at the end of the day Macy's has to answer to its shareholders. Macy's has given more than sixty million a year to charitable organizations over the past couple of years and continues to place charity giving at the forefront of its agenda. ﻿ The next panel discussed ecoconscious fashion with most of the panel agreeing that even if a company has a certification for being green or organic it is still necessary for individuals to conduct their own due diligence. The panel on fashion and labor addressed the problems fashion labels were incurring as they move their factories from China to Bangladesh and Pakistan due to the cheaper supply and labor costs. Poor factory conditions and numerous fires have led fashion companies to hire third party monitors to control the situation. Most of the speakers confirmed that fashion labels, such as Tommy Hilfiger and Ralph Lauren try to maintain adequate labor conditions for their workforce and most of their employees have high job satisfaction. The last panel was both fascinating and frivolous and I enjoyed every minute. The panel discussed 3D printing and how it is currently being used in the construction of high end dresses. The 3D printing allows designers to create dresses through futuristic means in forms previously uncreatable through handiwork alone. 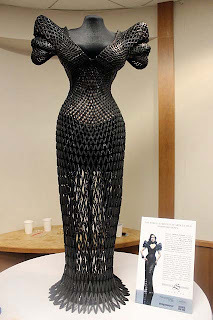 Michael Schmidt, a clothing and jewelry designer who has designed costumes for Madonna, Lady Gaga, Rihanna and Cher, exhibited the 3D dress he made for Dita Von Teese. He partnered with architect Francis Bitonti, and using complex digital code and lasers, completed a dress four months later which had length, width and also depth making it malleable and wearable at the same time. The cost of the dress was easily over one hundred thousand dollars however, 3D printing is quickly becoming the future of fashion. Eventually, 3D printing will allow people to print their own clothing from home enabling laymen to copy clothing and accessories in vast numbers. Therefore, design patents will be needed to protect designers from mass imitation as reiterated by the entire panel. The day concluded with some martinis and champagne in the Atrium of Fordham Law School. A procession of models paraded down the balconies in digitally printed dresses, designed by Mary Wang and Jenna Fizel, and 3D jewelry designed by different artists. Many of the panel members stayed to talk to students, eat some chocolate, and discuss the day's events. There was so much information to process I realized then why I was so happy I no longer practice law; while being well dressed is not that hard a feat to achieve, studying the law and artifice behind being well dressed is indeed exhausting.